I read with care the interesting series of articles "Piltdown man: the missing links" by Dr L. Harrison Matthews (16 March-2 July, 1981). Matthews has written a fascinating account of the sort of happenings that lay behind the Piltdown forgery, and 1 doubt if there is anybody now alive who could have recounted this extraordinary story with greater insight .Of course he had to lace together the facts through a use of artistic licence. I find only one serious flaw in the reconstruction. There is no proved factual evidence known to me that supports the premise that Father Teilhard de Chardin gave Charles Dawson a piece of fossil elephant molar tooth as a souvenir of his time spent in North Africa. This faulty thread runs throughout the reconstruction, leading to the production by Teilhard of the fraudulent canine tooth, which Matthews supposes Teilhard (driven by a laudable motive) took from his waistcoat pocket on 30 August, 1913, saying in effect to Dawson and Woodward 'I have found the missing canine tooth". of Sciences on 23 February, 1952*. On looking at this tree the reader may be surprised to find that Eoanthropus was placed by Teilhard the lineage leading through Swanscombe Mail to Homo sapiens. 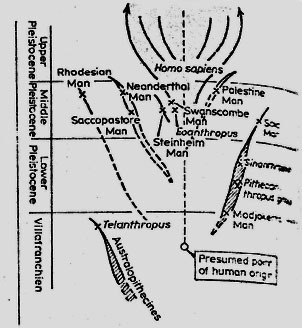 Clearly he was not seeing Eoanthropus as an ape-man as Eoanthropus was defined by A.
note that in a paper published by Teilhard in 1920 he supported the view that the Piltdown mandible (lower jaw) was that of a Pleistocene ape, whereas the Piltdown cranial bones were those of a Pleistocene man. In answer to the question raised by G. L. Townshend of Leeds (Letters, 24 September, p. 823). When an acid-insoluble residue of the Piltdown mandible (lower jaw) was examined by means of the electron-microscope, intact collegen fibrils were revealed; but when the same method was applied to acid-insoluble residues of the cranial bones no such structures were seen. Chemical analysis (Oakley, K.P. 1955) of the cranial bones showed up in 7.5 per cent organic carbon, representing degraded collagen, quite sufficient for radiocarbon dating. Miller, G. S. (1915) Smithson. miscell. Col., vol. 65, p. 19. Oakley, K. P. (1955) Bull. Br. Mus. Nat. Hist. (Geol.) vol. 2 p. 254. York Acad. Sc., vol. 14, p. 208. Weiner, J. S., Oakley, K.P., and Le Gros Clark, W. E. (1953). Bull. Br. Mus. Nat. Hist. Woodward, A. S. (1912) in Dawson, C. and Woodward, A. S., Quart. J. Geol. Soc. Lond. Dr. Kenneth Oakley died on 2 November (see p. 421). One of the last pieces to come from the pen of Dr Kenneth Oakley, the much liked and respected British anthropologist who died last week. was a letter to New Scientist. In the letter (page 457), Oakley comments on Dr L. Harrison Matthew's series of articles in New Scientist reconstructing the events of the famous Piltdown fraud. For most of his working life, Oakley was employed at the British Museum (Natural History). He will be best remembered for the research that proved the remains of :he Piltdown Man a fraud, The claim that Piltdown Man provided a missing link between man and the apes held good until Oakley's research blew the hoax sky high in 1953.